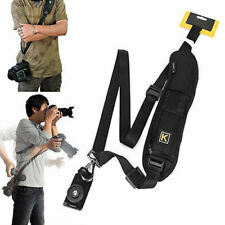 Quick Rapid Double Dual Shoulder Sling Belt Strap for 2 Digital SLR DSLR Cameras. 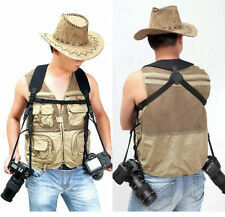 Design for professionals and easily carried with two DSLR. We might require you to send us photo/s of the item received and also your original item so we can compare and conduct necessary actions. This is our SOP, for us to be certain and for record purposes. New Speed, 150 lbs tested. Take Pride. Can't stay still?. The Quick strap F-1 will keep your gear safe and steady in even the most strenuous situations. The Focus F1 makes photography more enjoyable. This small inexpensive item can save a lot of money in the long run. 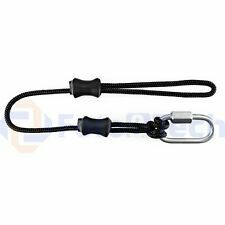 The cord is made from lightweight durable fiber, and the carabiner with a hex nut screw lock is made from stainless steel. Made in USA. 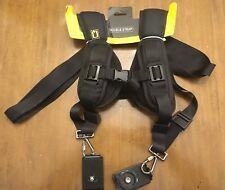 Double Dual Shoulder Strap Belt Holster Sony RX100 III Alpha A5000 A6000 A77 II. 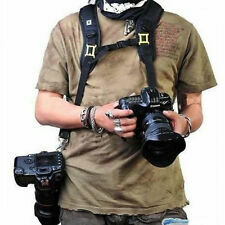 Distributes overall weight of DSLR evenly across your shoulder. 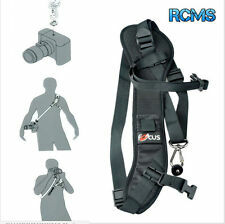 Feature4: dslr strap. Usage: Shoulder. Comfortable to use. The strap adopts ergonomic design, and the weight is distributed evenly by way of the shoulder pad. Extra large Sponge on shoulder pad. Upgraded New Shoulder Pad Material for Extra Comfort during use. Nylon pouch for storage and transport. Designed to be worn across a left-handed user's body, draped from the right shoulder to the left hip. Sport Left Breathe. The complete warranty is included with the product. Design for professionals and easily carried with two DSLRs. •Built for speed, for when timing is everything. •Size: One fits All. Hand cut, crafted and dyed in the Kent by myself using only the finest leather, fixings, dye and finishes. Colour may vary slightly. Due to the nature of the leather used there may be small blemishes in the leather. Part number: ACAM E25R KK. Premium quality quick adjust sling strap made by Artisan and Artist, Japan. Can be used as a neck strap, shoulder strap or a sling. Award winning "Easy Slider" design. 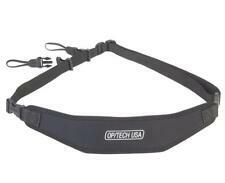 The BosStrap Generation 3 Sliding Sling Strap (BosStrap G3) is a two-part sliding sling system which includes a 1½” wide sling strap and the Patent Pending Generation 3 BosTail (G3 Tail). The wide strap evenly distributes the weight of your gear, obviating the need for a shoulder pad while making the BosStrap G3 convenient to use, light weight, strong, and easily stowable. Cross-body sling shooting, just in one swift motion from rest to shooting. 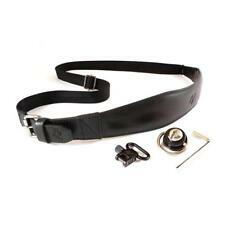 Tightness of strap adjustable and suitable for people of all body. UK Orders We're sorry if your item is not in perfect condition. One piece very well finished screw with high quality anti-skid pad. We're sorry if your item is not in perfect condition. UK Orders. The Q strap now has a improved ergonomic bend so it fits more securely on your shoulder. Single Q strap. UK Orders We're sorry if your item is not in perfect condition. Ergonomic design. Many of the sliding sling features are shown in this short video.Video: BosStrap Features. BosStrap Material Nylon Seat Belt. BosStrap Size 1-1/2” wide, 64” long. A sliding sling strap is a. The Side Release Tail has a male and a female side. The inner of the strap is made from a soft, durable neoprene padding with an anti-slip weave and the outer fabric a soft woven nylon for extra comfort. The unique screw-in plate is made of high quality ABS material with two strap eyelets on both sides for attaching a hand strap and a neck strap. Internally-padded nylon webbing has a smooth side that glides over clothing in sling mode and a grippy side that prevents slipping in shoulder mode. Plus, Anchors work with any Peak Design or 3rd party tripod plate. Luka 3 Pro (Brown). Sling Strap. Sling Strap Pro. The leather that we have used is top grade leather with Full Grain. The hook we choose for our strap leather was made from top Stainless steel INOX 316 that provide a strong durable hook and avoid corrosion in the long run. The Quick strap F-1 will keep your gear safe and steady in even the most strenuous situations. Upgraded New Shoulder Pad Material for Extra Comfort during use. Extra large Sponge on shoulder pad. Focus makes photography more enjoyable. The BosStrap Generation 3 LT Sliding Sling Strap (BosStrap G3LT) is a two-part sliding sling system which includes a 1” wide sling strap and the Patent Pending Generation 3 BosTail (G3 Tail). BosStrap Material Nylon Seat Belt. The Sling/Shoulder strap is made of 100% Polyester and soft rubber material, so light and easy on your shoulder and neck. The Quick Release Strap is worn diagonally across the torso from shoulder to hip and is adjustable to fit most photographers. Cross-body sling shooting, just in one swift motion from rest to shooting. Unique shoulder pad shape built for optimal weight distribution. Specially designed shoulder pad evenly distributes weight to minimize uncomfortable fatigue. The hand and machine washable (air dry) design enables easy cleaning. 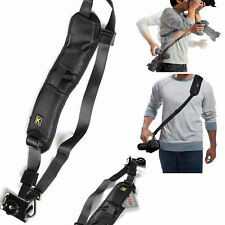 If you use a Sony or Canon DSLR with the battery grip, you may want to check out the BosStrap Dual BosTail. You can simply connect to the tripodbefore releasing your non-BosStrap strap. Simply attach the carabiner on your existing strap to a BosTail ring. 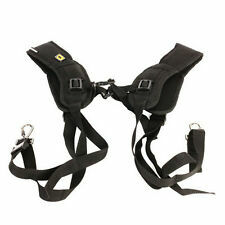 The length of the sling strap is adjustable, very convenient to use. The shoulder strap is made of high quality neoprene, very soft and comfortable to wear. It adopts ergonomic design, and weight is distributed evenly by way of shoulder pad. Leash has incredible versatility, and more importantly, zero slop. Easily adjust length with dual aluminum and Hypalon quick-adjusters, designed to operated with just 1 finger. Connects and disconnects quickly using the unique Anchor Link system, and stows easily in your pocket or bag.